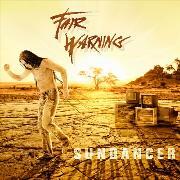 In their 23rd year of existence FAIR WARNING releases a remarkably tepid album even though the rays of the sun are on the cover and in some songs. FAIR WARNING was formed in 1991 by former V2 vocalist Tommy Heart and ex. ZENO bass player Ule Ritgen. They soon found guitarists Andy Malacek (LAST AUTUMN´S DREAM) and Helge Engelke (DREAMTIDE) plus drummer Jurgen “CC” Behrens. During their 23 years of existence Andy has left, otherwise the band is intact, which is quite a feat these days. This is studio album number seven, add some compilations and live albums and you´ll agree that they are doing seriously alright. What is both prominent and, in this case, a problem, is that FAIR WARNING has added a lot of pop to their sound. When they release their powers, as in the excellent “Man in the Mirror”, opener “Troubled Love” or “Keep It in the Dark” everything is great. But when they try to reach a wider audience than they already have, as in the prog-inclined poppy “Get Real”, or the overly American sugar sweet unnoticeable “Pride”, it all goes down the drain. The feeling of an aspiring dream of entering the European Song Contest comes to mind as “Touch My Soul” comes and goes, and surely the riff of “Natural High” has been in usage enough times already by the end of the previous decade? The ending of the light and lukewarm “Cool” sums things up for me. The refrain is stubborn, but otherwise they just don´t click. A return to the first five tracks of the album would sort things out, never mind the latter day BON JOVI antics or possible dreams of the ESC. FAIR WARNING has a place in most hard rock fans heart, but this is not the way to keep that relationship.